I wanted to make a sauce using the fresh Black Mission figs we have & figured a pork tenderloin would be the perfect vehicle for it. It's been so long since we've had a tenderloin & I don't know why. We love grilling & roasting tenderloins as they cook quickly & there is so much you can do with them flavor-wise. This sauce was a wonderful compliment to pork: slightly sweet, slightly tart & very figgy. It was super simple to make & I think made for a "good-enough-for-company" presentation. Don't leave the thyme out of this sauce; I was surprised that such a small amount made such a big difference in the final flavor. Melt the butter in a small saucepan over medium-high heat. Add the onions & sauté until soft & translucent. Add the figs & cook a minute of two to start breaking up. Stir in the honey, wine & vinegar. Season with a little salt & pepper. Bring to a boil. Reduce heat & let simmer uncovered for about 10 - 15 minutes until reduced & thickened. Add the thyme leaves & check seasoning for salt. Serve warm over pork tenderloin or maybe some pork chops. We had some leftover & I'm looking forward to using it as a spread on a ham & cheese sandwich for lunch today. Can you believe we are down to less than one flat of fresh figs already? Have you entered to win your bounty of figs from the CA Fig Advisory Board yet? Pork tenderloin is one of my favorites. I like that it's pretty lean too. I bet that fig sauce was amazing! This looks amazing! I only recently got into figs, and I can't get enough. I bet this fig sauce is TO DIE FOR. I make something very similar to this. (hasnt made it to my blog yet). I use Giada DeLaurentis 's recipe. We love it. Something amazing about pork and figs! It looks like fall is in the air! What a great combination! I really need to get a pork tenderloin from the farm here. It is one thing we haven't tried on the new grill. i'm truly appetized by this--your fig sauce is one of the most beautiful things i've seen all day, and it's perfect for some meaty pork loin. 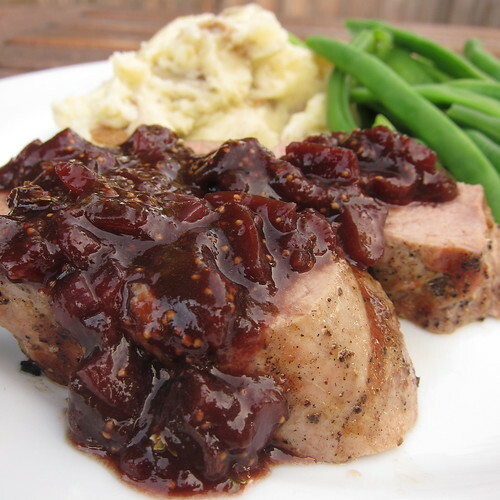 This Pork Tenderloin with Fig Sauce looks wonderful. Thanks for the recipe! Wow! This looks so delicious! I want to try and make some for the weekend. Thanks for sharing this dish. The fig sauce was delicious! I have a fig tree in my yard and made this recipe to go with Pork Loin Chops, I will definately make this again. Came across your recipe while searching for fig sauce. I made it yesterday and it is AWESOME! We have a fig tree in our yard and now I know what to do with them. Thanks!